Power Bank Buying Guide: Make sure you’re always connected with back up battery power that’s as mobile as you are. In today’s world we’re used to being able to access news and information quickly, interact on social media, perform research, and communicate instantly, from anywhere, through our electronic devices such as cell phones and tablets. Our mobile devices require battery power to keep us constantly connected while on-the-go. Since everlasting batteries have yet to be developed, we need a power source to operate our devices while out and about. We simply HATE the dreaded red battery power symbol. Sure, taking your wall charger with you is an option, however you won’t always have access to an outlet or the ability to sit around and wait for your device to charge. Power bank portable phone chargers are a great cell phone accessory to have with you, for both easy charging and emergency situations. If you’re considering purchasing promotional power banks branded with your logo to use as a giveaway item, you may have some questions. How do power banks work? How much power do they have? Which charger is best? Which one should I buy? Will this work on an iPhone® or Samsung® device? 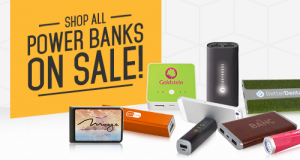 Power banks are one of ePromos favorite products, as well as one of our best sellers! We’ve taken all of our knowledge of power banks and portable chargers and compiled it into this helpful guide to assist you in choosing which power bank is the right one for your customers or employees! Simply, a power bank is an external power source which can be used to charge a phone or any portable device with a USB port. How do I charge the power bank? Since power banks arrive uncharged, before its initial use, plug in the power bank to build up its power. Charge the power bank via a USB wall charger or by connecting it to the USB port on a desktop computer or laptop. How long do I need to charge my power bank? The time to fully charge a power bank depends on the capacity of the power bank, as well as the charging method used. A power bank with a higher charge capacity is going to take longer to reach a complete charge opposed to a model of a lesser capacity. Also, charging with a wall charger and the original USB connector usually results in a quicker charge than plugging into a laptop or using a foreign charging cable. How much power do they have? What is mAH? mAh stands for milliAmpere-hour. The official definition of an ampere hour or amp hour is a unit of electric charge, having dimensions of electric current multiplied by time, equal to the charge transferred by a steady current of one ampere flowing for one hour. For power banks, this is the unit of measurement used to express the electrical capacity of smaller batteries like those found in power banks. That may sound complicated, but it’s really not that bad. To determine a battery’s capacity, hook it up to supply a 1000 mAh discharge and see how long it lasts. If it lasts an hour, hey, it’s a 1000mAh battery. If it lasts seven and a half hours, well then, it’s a 7500mAh battery. How Many Charges Will I Get? The primary attribute that differentiates various power banks is their power capacity. The capacity is measured in mAh, and while it’s difficult to pinpoint exactly how many charges a specific power bank will give a device, the standard rule is the higher the mAh rating, the more capacity the power bank holds. For example, a cell phone with a battery rated at 1500mAh will be able to receive one full charge from a power bank rated at 1500mAh. It’s important to purchase a power bank that at the very least matches the mAh of a portable device. If the mAh of the power bank is lower than the device, it will not work or provide the desired results. If you want to get multiple charges out of a power bank, purchase a power bank with a higher mAh rating than the device battery. So, if you’re buying as a promotional item, giveaway, or gift for employees, it makes sense to error on the side of caution and choose a higher mAh to ensure they will work on various devices. You can find the mAh specs of the device located on its battery. Here are some guidelines to remember for power capacities and the charging capabilities. It’s also important to note the efficiency rate of power banks is about 50-60% of the stated capacity. This is due to the conversion of the charge from the power bank battery to the mobile device, and the loss of power that happens through the USB cable. Along with exceeding, or at least matching the mAh capacity of the device’s battery, you also want to make sure you choose a power bank that suites the device’s charging adapter. You’ll want to choose a power bank that is equal to, or more than the output voltage and output current listed on the factory USB charging adapter provided with the device. This will ensure the power bank charger can charge the device at a rate similar to that of the factory wall charger. Size and portability is something to keep in mind when purchasing power banks. While all power banks are designed to be a charging source on-the-go, they come in various shapes and sizes. Whether the user wants to be able to carry it in their pocket, or throw it in a purse or book bag, this should be taken into consideration when determining which power bank is best. Charging multiple devices is also a selling point when it comes to power banks. Do you want to offer the ability to charge more than one device at the same time? A power bank with multiple USB ports may the right option for meeting the user’s technical needs. Whether constantly on the road making calls and doing business, listening to music and browsing social media, or on a road trip using a phone for navigation, a power bank is a great item to have as both an everyday accessory, and an emergency back-up. With a power bank portable charger, your customers or employees never have to worry about being unplugged from their device.